Alf Göransson spoke of the importance for Securitas’ to focus on its profitability and to differentiate ourselves from our competitors; “We offer added value through optimized security solutions. Over the past few years, this strategy has been successful in the various business cycles – both in difficult and in more prosperous times. “Securitas has a successful business model. We perform professional risk assessments and risk surveys at our customers’ sites, analyze our customers’ needs and expectations, design security solutions, often in combination with mobile patrols, alarm monitoring and technical solutions. In 2010, we also strengthened our competence in sophisticated consulting and investigation services, which I believe will be even more important for our customers in the future. “We are continuing to pursue our long-term strategy. More than one third of our sales volume is generated by specialized branch offices that focus on one or very few customer segments. This is gradually leading to improved margins, higher growth, long-term and improved customer relations, and our branch managers are constantly seeking solutions that will add value to our services. Also, as an added benefit, employees who possess specialized knowledge and enhance their skills remain working at the company for a longer period of time. “We believe that knowledge can be transferred from one market to another, and that our customers expect advice from us that is based on global knowledge. 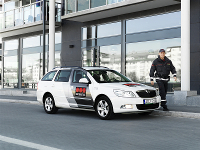 My Securitas was launched in 2010 to strengthen and more efficiently structure our knowledge. It is an online professional social network, with Facebook functions, blogs, an internal “Wikipedia” with an advanced search engine and best practice databases. Approximately 4,500 users now have access to the network and in 2011, we will expand the user group to about 17,000 employees from throughout the Securitas world. This is unprecedented in the security industry – a tool for sharing knowledge, locating security knowledge, and creating all kinds of communities. This will lead to better security solutions and add value to our customer offering. Alf Göransson said he was proud and impressed by how Securitas delivers high-quality services in almost every corner of the world every single day, he continued, “but I am equally in awe of how we constantly strive to add value to our services by providing more and better security in an efficient way. This impatient culture has been built by decades of consistent work, commitment and management, and is based on our values and our management model, the Toolbox, for running and managing our operations internally. We have now taken our Toolbox one step further and developed a Securitas Group standard, the Diamond Box, for doing business externally with a clear focus on security. The separate pieces of our methodology may not be unique, but the way we systematically and consistently combine them and build the processes behind each component is without comparison. Market by market, we are also making our services more transparent and accessible in state-of-the-art online customer portals, which provides customers a complete overview of their security solution. As security professionals, we understand our customers’ needs, provide optimal service and build profitable relationships. In addition to the models of how we do business, we are also building a stronger culture of innovation in Securitas, which will benefit both us and our customers. “We are currently creating an infrastructure that will support innovation. A culture where everyone is encouraged to present ideas that will be nurtured, rewarded, tested, and if they are strong enough, implemented and allowed to grow. Innovation can take many forms. It could mean better ways to conduct sales and marketing, or describe the benefits of our services. It could be new technology or tools, but also new business concepts or methods for making our operations more efficient. “Our strategy of focusing on profitability and differentiating ourselves from our competitors through the added value that we create by optimizing our security solutions, works when times are both tough and better. In terms of profitability, the last three years have been our best ever. In 2010, earnings per share declined 2 percent compared with 2009. Adjusted for the strengthening of the Swedish krona in 2010, earnings per share increased 5 percent in real terms compared with the preceding year. We are coming out of the recession in good shape. In 2010, the Group operating margin amounted to 6.1 percent (2009 6.0 percent)” commented a satisfied Alf Göransson.